EDITOR’S NOTE: Updated Dec. 1 with news that Soyuz rocket launches will be permitted to continue as scheduled. Multiple replays of Tuesday’s launch of a Soyuz-2.1b rocket from the Vostochny Cosmodrome in Russia’s Far East. Liftoff occurred at 0541 GMT (12:41 a.m. EST; 2:41 p.m. local time at Vostochny). The Fregat upper stage and its 19 satellite passengers, including a Russian weather observatory and spacecraft for U.S., Canadian, European and Japanese companies, likely fell into the Atlantic Ocean after igniting its main engine in the wrong orientation, the reports said. Russian space agency officials acknowledged the mission failed Wednesday, a day after engineers first determined something went awry when the Meteor M2-1 weather satellite launched aboard the Soyuz/Fregat rocket never made contact with ground controllers. The Fregat upper stage was supposed to ignite its main engine seven times after separating from the third stage of its Soyuz booster following liftoff Tuesday from the Vostochny Cosmodrome in Russia’s Far East. The Soyuz rocket functioned normally, Russian officials said, placing the Fregat upper stage and its payload stack into an arcing ballistic trajectory just shy of the velocity required to enter orbit around the Earth. The Fregat engine’s first burn was programmed to reach a stable parking orbit, and five more burns were planned to release the mission’s 19 satellite payloads into four distinct orbits several hundred miles up. A seventh Fregat engine firing was supposed to de-orbit the stage to burn up in Earth’s atmosphere. The Fregat detached from the Soyuz third stage as planned around 9 minutes, 23 seconds, into the mission, according to Glavkosmos, the Russian launch broker that booked rides for the U.S., Canadian, European and Japanese satellites aboard Tuesday’s doomed flight. But the upper stage’s guidance computer — separate from the Soyuz rocket’s systems — strayed from the mission’s expected profile moments later. Russia’s state-operated RIA Novosti news agency and the respected space website RussianSpaceWeb.com reported the Fregat upper stage made an unanticipated turn before starting its planned 77-second orbital insertion burn. A programming error may have led the Fregat stage to attempt an unnecessary 360-degree maneuver, leaving the rocket in the wrong orientation for the engine firing, according to RussianSpaceWeb.com, a website run by Russian space journalist Anatoly Zak. The website reported the Fregat’s guidance computer did not have the correct settings for a launch from Vostochny, a remote facility in Russia’s Amur region near the Chinese border. It was the second Soyuz launch from the new spaceport, and the first from Vostochny with a Fregat upper stage, which flew more than 60 times previously from other launch sites in Russia, Kazakhstan and French Guiana. Russia’s Interfax news agency also reported a programming mistake caused the failure. RIA Novosti quoted a space industry source as saying the Fregat needed to only nudge its orientation by 2 degrees, but instead tried to maneuver in the opposite direction by 358 degrees. 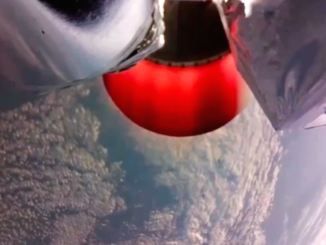 A video shot by a British Airways flight crew over the North Atlantic Ocean shows an object breaking apart high in the atmosphere less than a half-hour after the Soyuz/Fregat launch from Vostochny. The video, shared on Twitter by a British Airways flight attendant, was recorded around 750 miles (1,200 kilometers) southwest of Reykjavík, Iceland, near the rocket’s planned flight path. Jonathan McDowell, an astronomer who tracks global launch activity, said there was a “high probability” the re-entering object was the Fregat upper stage with its satellite payloads. A status update released by Roscosmos on Friday said the Fregat upper stage likely fall in the North Atlantic, around 42 degrees north latitude and 38 degrees west latitude. The fall zone is consistent with the location of the British Airways sighting. The government-commissioned board investigating the failure will be charged with determining the official causes of the accident. The investigation will be led by Oleg Skorobogatov, deputy general director of TsNIIMash, a Russian research institute specializing in launch vehicle, spacecraft and missile development. Alexander Medvedev, deputy general director at TsNIIMash and general designer for launch vehicles and ground-based space infrastructure, will be deputy head of the commission, the Russian space agency Roscosmos announced Wednesday. The investigation team will include specialists from Roscosmos, leading research institutes of the rocket and space industry, and representatives from the Russian Defense Ministry, the space agency said in a statement. The commission is expected to work until Dec. 15, Roscosmos said. 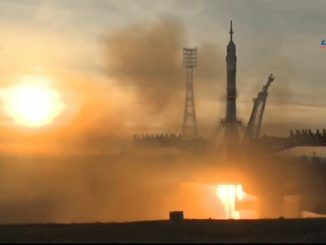 Investigators have exonerated ground infrastructure at Vostochny and the lower three stages 0f the Soyuz-2.1b rocket, and Soyuz launches not carrying Fregat upper stages will continue as scheduled, the Russian space agency announced Friday. A military satellite launch on a Soyuz-2.1b rocket from the Plesetsk Cosmodrome in northern Russia was set for Saturday, and a three-person space station crew is set to lift off on a Soyuz-FG rocket Dec. 17 from the Baikonur Cosmodrome in Kazakhstan. Neither mission will use a Fregat upper stage. The next Soyuz launch with a Fregat upper stage was expected Dec. 22 from Vostochny. That status of that launch campaign remains unclear. Fregat upper stages are built by NPO Lavochkin, and Tuesday’s failure was the third launch mishap attributed to the rocket pack, which has a main engine and control thrusters fueled by storable hydrazine and nitrogen tetroxide propellants. The Fregat is designed for multiple firings to place satellites into different orbits, or deploy payloads into high-altitude perches for navigation and communications missions. Russia’s last year without at least a partial launch failure was 2003. Investigators have blamed quality control problems, design flaws and human error for mishaps in recent years, including the over-filling of a Block DM upper stage’s fuel tanks and the upside-down installation of rate sensors in a Proton rocket’s booster stage. Russia’s Meteor M2-1 weather satellite and 18 co-passengers were lost in Tuesday’s failure. Twelve CubeSats for two California-based companies were among the secondary payloads: Ten Lemur-2 spacecraft for Spire Global’s ship tracking and weather monitoring network and two Landmapper-BC Earth-imaging satellites for Astro Digital. The first prototype satellite for Telesat’s planned low Earth orbit broadband communications constellation was also on Tuesday’s failed mission. The Canadian company operates a fleet of geostationary broadcast satellites more than 22,000 miles (nearly 36,000 kilometers) over the equator, but officials plan to field a network of at least 117 lower-altitude satellites in the next few years, providing low-latency broadband links for airplanes, ships and customers in remote posts around the world. Telesat ordered two demonstrator satellites in April 2016 to help engineers wring out technical hurdles before the company builds out its Ka-band network. Telesat purchased the prototypes from different contractors to compare their performance. Telesat’s LEO Vantage 2 satellite was the first of the test craft to reach the launch pad. The roughly 154-pound (70-kilogram) prototype satellite was built by the University of Toronto Institute for Aerospace Studies Space Flight Laboratory, and Space Systems/Loral in Palo Alto, California, served as prime contractor. Officials eye the U.S. military and the aviation and maritime industries as prime markets for the network, one of several low Earth orbit communications constellations in the works by companies like SpaceX and OneWeb. Telesat says its Ka-band network will reach under-served communities and far-flung outposts with high-speed Internet connectivity. Another test satellite, named LEO Vantage 1, is set for launch on an Indian Polar Satellite Launch Vehicle in early January. It was provided by Surrey Satellite Technologies Ltd., a British subsidiary of Airbus Defense and Space. 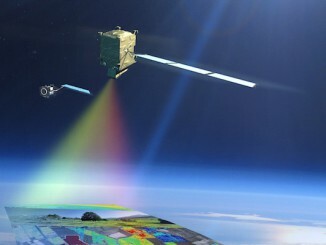 Telesat planned to verify each satellite design’s capabilities next year. “Notwithstanding this failure, Telesat’s plans to develop a state-of-the-art, high capacity LEO constellation that will deliver transformative, low latency, fiber-like broadband to commercial and government users worldwide, remain on track,” Telesat said in a statement, confirming plans to launch the second demo satellite in the coming weeks. A Russian student-built microsatellite, a small Japanese spacecraft designed to measure the amount of space junk in low Earth orbit, a Norwegian maritime surveillance payload, and two CubeSats from Sweden and Germany were also on Tuesday’s launch.